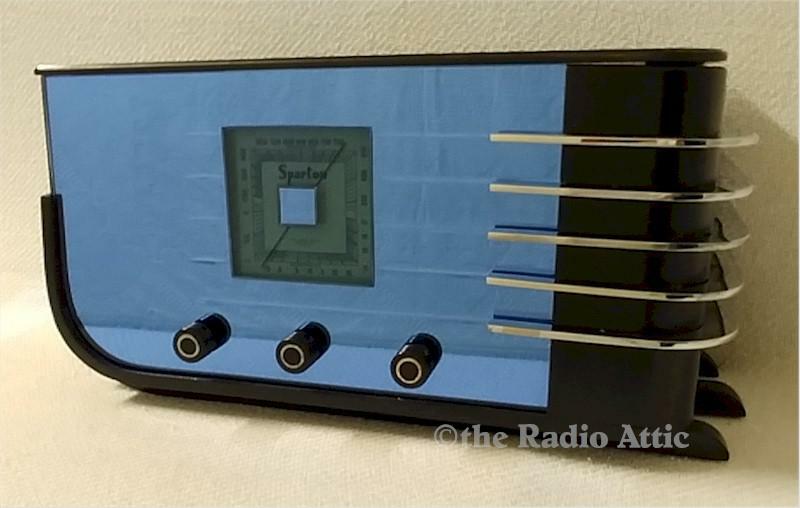 Joe's Radio Shop is proud to present another exceptional Art Deco radio. It was designed by Walter Dorwin Teague for the Sparks-Withington Co. of Jackson, Michigan. Radio people refer to it as "The Sled" and it's highly sought after by collectors. There is a reproduction available of this iconic radio, however this is an authentic one! This All American five-tube radio receives broadcasts across the AM band and was professionally rebuilt by Blake, a proud member of the Joe's Radio Shop team. The capacitors have been replaced, tubes and resisters tested and replaced as needed. A new cloth line cord was added as was an 8-ft antenna. A complete alignment was performed to complete the chassis restoration and the radio plays like new. The cabinet was refinished, all of the mirrors have been re-silvered and the chrome bars have been replated. Don't miss out on an opportunity to own this wonderful piece of art! You will never regret buying the best! 18"W x 9"H x 8"D.